Land is fundamental to the lives of poor rural people. It is a source of food, shelter, income and social identity. Secure access to land reduces vulnerability to hunger and poverty. But for many of the world’s poor rural people in developing countries, access is becoming more tenuous than ever. IFAD, FAO, UN-HABITAT, the International Land Coalition Secretariat, the Global Land Tools Network Secretariat and OXFAM co-organised a Workshop on Land Indicators on 21-22 February in Rome. The workshop is part of an on-going consultation to identify a set of indicators to monitor progress in land governance. The event brought together a range of stakeholders from governments, farmers’ organizations, civil society, multilateral organizations and institutions interested in food security and land issues. The need for common land indicators is greater than ever because of the monitoring demands have been, or will be, created by the post-2015 agenda, the Voluntary Guidelines on the Responsible Governance on Tenure of Land, Fisheries and Forests (VGGTs) and the Framework and Guidelines on land policy in Africa (F&GLPA). There is also demand for common frameworks for project monitoring and evaluation. The Global Land Indicator Initiative (GLII) was established in 2012 with the aim to support efforts to harmonize monitoring efforts around land tenure and governance. GLII seeks to derive a list of globally comparable harmonized land indicators, using existing monitoring mechanisms and data collection methods as a foundation. 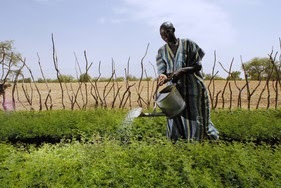 The Initiative is supporting global and regional frameworks such as the Voluntary Guidelines on the Responsible Governance on Tenure of Land, Fisheries and Forests (VGGTs), agreed by 193 Member States and supported by civil society on the one hand, and the Framework and Guidelines (F&G) on land policy in Africa, a joint initiative of the African Union Commission, the African Development Bank and the United Nations Economic Commission for Africa on the other. The Initiative intends to foster partnership, inclusiveness, consultation, evidence-based indicators, people–centred approach and sustainability. In September 2012, UN-Habitat, the World Bank and the Millennium Challenge Corporation (MCC), met in Naples, Italy, to discuss how to advance the harmonization of global land indicators through a multi-stakeholder consultative process. Since then two other meetings have been organised on land indicators, one in April 2013 in Washington and another in November 2013 in The Hague, with an increasing number of participating organisations. Concerns have been raised that the voices of civil society have not been coming out very strongly. This workshop has succeeded in broadening the participation in this initiative with a strong representation from farmers’ associations (such as Asian Farmers’ Association, East African Farmers’ Federation and the Network of Farmers' and Agricultural Producers' Organisations of West Africa), large networks such as the FoodFirst Information and Action Network (FIAN), the International Planning Committee for Food Security (IPC) and Civil Society Mechanism (CSM) of the Committee on Food Security (CFS). Some of the participants are involved in the wider process of developing and negotiating the post-2015 agenda/Sustainable Development Goals. Indeed, it is important that momentum is maintained to ensure the inclusion of land-related targets and indicators in the final framework. Measurability is one factor that will be taken into account in finalizing the targets and indicators. Going forward, the post-2015 process to agree goals and targets will be mainly focused on intergovernmental negotiations, with the selection of the indicators also being a high-level process in which UN and other multilateral agencies will play a key role. High-level lobbying therefore needs to be taken forward by different stakeholders: intergovernmental partners, civil society organisations and supportive government representatives. Workshop participants agreed to support this process by providing key messages on why the land indicators and the targets they relate to are important, by showing that they enjoy wide support, and by showing that there are feasible mechanisms for assessment. IFAD has assigned strategic priority to participating in the global dialogue on the post-2015 development framework and will focus on four themes: i) Leveraging the rural-urban nexus for development; ii) An empowerment agenda for rural livelihoods; iii) Investing in smallholder family agriculture; and, iv) promoting resilience of poor rural households. Security of rural people’s tenure over land, property and other natural resources is the first cross cutting target area relevant for all the themes. The initiative seeks to address these other harmonization demands in parallel. The VGGT and F&GLPA provide benchmarks and create an opportunity for governments and other actors to track and monitor progress. Indicators are relevant to monitoring and tracking of the VGGT and F&G. Monitoring strategies for the VGGT and F&GLPA need to be developed through a very inclusive process of stakeholder involvement, and for that reason should be seen as a longer-term process. CFS will monitor the implementation of the VGGT and is a globally legitimate arena in which to expand the discussion on indicators. The participation in this workshop of HE Gerda Verburg (Chair of CFS) and HE Robert Saabiti (Uganda’s Permanent Representative to the Rome-based agencies and sitting on the CFS Bureau representing the Africa Region) has therefore been very important. The harmonization of project monitoring indicators is also something that can be advanced in parallel. A number of different multilateral and bilateral donors support tenure and land governance-related projects and programs and employ indicator frameworks to monitor these. A key concern in such monitoring is to evaluate how projects and programs contribute to the implementation of global and regional goals and guidelines. Project monitoring can contribute to the collection of data on common global indicators so the relevant stakeholders need to be involved in the development of the latter. There was a general agreement among participants that the post 2015 discussions and the possibility of getting an indicator/set of indicators and possibly even a target on tenure security/access into the SDG framework are a unique opportunity to promote the global land agenda. This can feed into the development of M&E frameworks for tracking progress in implementing the VGGT and F&GLPA. Nevertheless, care must be given to ensure the right indicators and targets are identified which provide an incentive for good land governance. This must be done in a transparent and inclusive manner. All participants committed themselves to contribute to this effort. Many thanks to everyone involved in making the land indicators workshop a success.